The wavy background paper was done intentionally, I used a piece of textured paper from my stash, dry embossed, ink-stained and sprayed with mica spray. Getting something like this to adhere to anything can be a challenge. By using Best Glue Ever I did not need score tape or hot glue for these problematic papers. BGE even works on mirror board and ink soaked watercolor paper. Just a thin bead, holds it all down. Normally I run the bead very close to the edge. Because I did not want this down perfectly I brought the bead closer to the center. The layers held firmly and they were not stiff. Some glues make your cards stiff and can actually crackle if you bend them a little - that is because the glue is breaking under the paper! 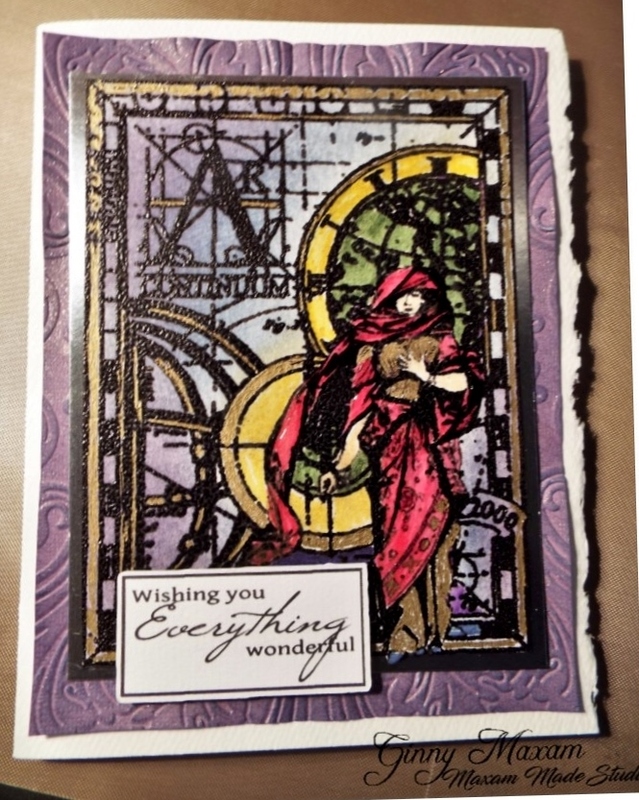 What a gorgeous card Ginny -= so wonderfully rich in texture colour and detail!